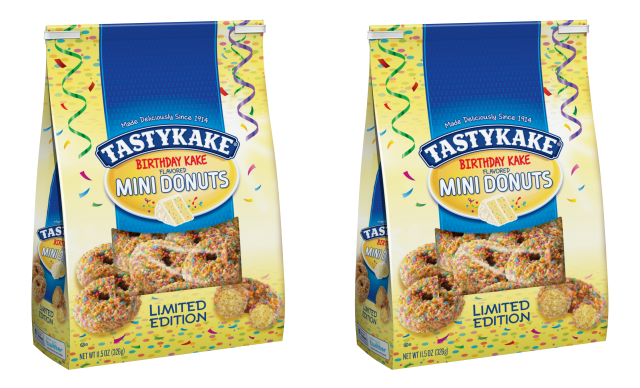 Birthday Kake Mini Donuts newly arrive from Tastykake this summer and feature birthday cake-flavored mini donuts with a colorful and festive crunchy coating. - Blueberry Mini Donuts - Blueberry-flavored donuts covered in powdered sugar. - Blueberry Sweet Rolls - Sweet rolls with blueberry filling topped with icing. - Orange Kreme Kandy Kakes - Mini cakes layered with orange creme-flavored filling and then covered with a white confection coating. All four items can be found now through August 26, 2017.